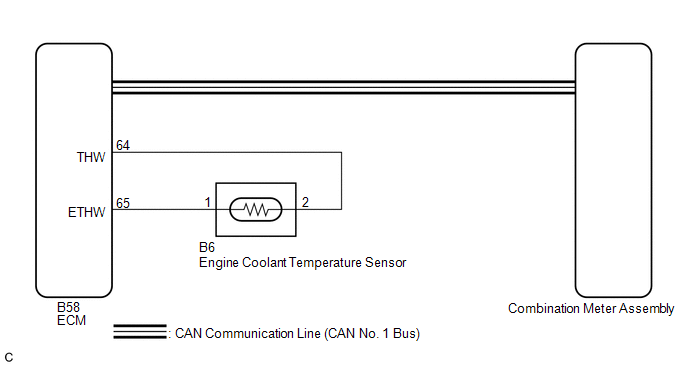 In this circuit, the meter CPU receives engine coolant temperature signals from the ECM using the CAN communication system (CAN No. 1 Bus). The meter CPU displays engine coolant temperature that is calculated based on the data received from the ECM. Engine coolant temperature receiver gauge indication is normal. (d) Enter the following menus: Body Electrical / Combination Meter / Data List. Engine coolant temperature value displayed on the Techstream is almost the same as engine coolant temperature receiver gauge indication. (d) Enter the following menus: Powertrain / Engine and ECT / Data List. Engine coolant temperature value displayed on the Techstream is almost the same as the Techstream indication (Body Electrical / Combination Meter / Data List).